Residential fencing disputes can be difficult to approach. Home owners have conflicting interests in maintaining a friendly relationship with their neighbours, whilst trying to protect their lifestyle and their homes. Therefore, when fences are required to be repaired or rebuilt, home owners can face challenges in finding a resolution that satisfies both themselves and their neighbours, particularly in relation to costs and materials to be used. In New South Wales, the Dividing Fences Act 1991 (NSW) regulates how costs of dividing fences are to be apportioned, confirms how to determine what a “sufficient dividing fence” might be for adjoining lands or common boundaries and details the process and implementation of fencing work. The use of the term “sufficient” allows for consideration of particular circumstances, including but not limited to, the present fencing, the use or intended use of each parcel of land, other fences used within the area, local government fencing regulations, concerns of privacy. 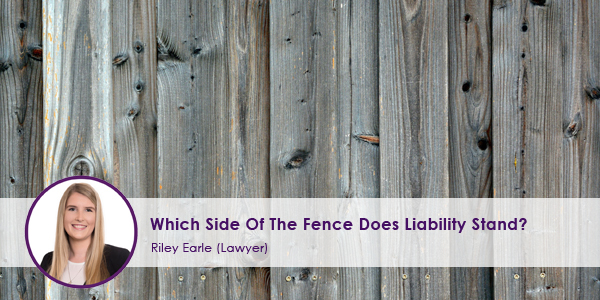 The general principle applying to costs under legislation is that if a sufficient fence does not exist, adjoining owners are liable to contribute to the costs associated with carrying work for a sufficient dividing fence. This principle, however, will not apply in instances of negligent or deliberate acts which require restoration work to fences. Whilst legislation empowers the Local Court or the Civil and Administrative Tribunal to make final determinations of “sufficient dividing fences”, home owners should be aware of the alternative cost-effective and efficient avenues they could pursue to resolve disputes, instead of seeking judicial assistance, which could further damage the relationship a home owner has with their neighbours. When facing fencing disputes, the first step should always be consulting your neighbour and trying to reach a reasonable agreement together. Although disputes can be challenging, it is important to recognise that an inconsiderate approach to a dispute may have an irreparable effect upon a relationship with adjoining neighbours and could result in living in a less than ideal environment. In the event that a conversation is ineffective in reaching a resolution, neighbours may attempt private or community-based mediation to deal with the issue in a cost-effective manner. Alternatively, a fencing notice can also be issued detailing proposed work and enclosing quotes obtained. Further, if the notice is futile, then the Local Court or New South Wales Civil and Administrative Tribunal could be considered to obtain an order for required fencing work. Coutts are able to assist in all areas of fencing disputes. If you wish to discuss your fencing concerns, need assistance determining what constitutes a sufficient dividing fence, or would like to assess your next steps please call (02) 4647 7577 to book an appointment with our disputes team. Newer PostTowards Zero – Road Safety Plan 2021. What does it mean for you? Older PostCan My Business Send Any Promotional Emails Without Restriction?